The action in Thor: Ragnarok emerges in what could've been complicated, too-defined blocks separated by this obvious humor, but the tightly-edited vigor of Waititi's somewhat cheesy, ‘80s-twinged craftsmanship give it enough of a flow so that it's a cohesive twist on the "hero's journey". The trials undertaken by Thor eventually toss him into the gladiatorial pit against a foe whom would've made for a brilliant surprise reveal, had Marvel decided to keep it under wraps: Hulk, in all his green and oversized glory. 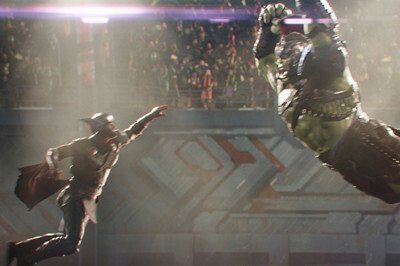 Despite the promo materials basically functioning like boxing posters announcing their brawl, it's a bold, dazzling fusion of computer-generated and practical work that holds onto numerous surprises, and leads well into an extension of the rapport between the two that made their moments from the Avengers films such crowd-pleasing displays. 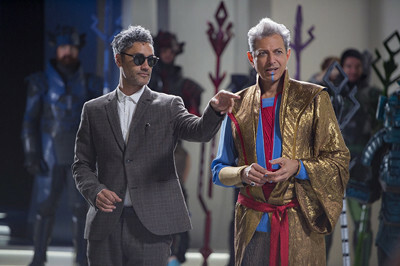 Knowledge that they'll be teaming up sets Ragnarok up for certain expectations, and Waititi both delivers on those and subverts ‘em, playing with concepts from the comics -- Planet Hulk! -- while scurrying around under the quirky authority of a sassy Jeff Goldblum. Gonna be honest, though: the Dolby Atmos track didn't do as much for me as I would've liked. The activity is persistent throughout the track, and it makes generous use of the object-based surround stage, ranging from shattered stone and glass to magic sparks and futuristic weapons firing off. Dialogue has plenty of highpoint and midrange strength, latching onto both Hemsworth's heavier delivery and Goldblum's thin, softer-spoken cadence. The points where the track slumps can be found with heavier effects that should possess lower-end resonance, whether it's explosions and collisions or the high-impact fierceness of the brawl between Thor and Hulk. The thud of punches and slam of bodies has some punch to ‘em, but it's much more restricted and flat than anticipated, rarely filling the room in those instances where fire rages and hearty objects have impact. For the most part, Hulk's deeper dialogue reaches into the lower-frequency channel, and a few subtler thumps -- such as a heavy ball bouncing against a wall -- hold their own. There's just something missing in the more aggressive action-film moments that should've been chest-rattling. 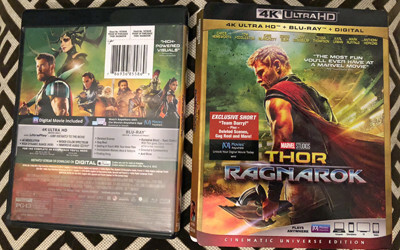 Just like most of the other 4K UltraHD discs out there, most of the extras for Thor: Ragnarok can be found on the included Blu-ray disc, yet there's one that does appear on both: the Audio Commentary with Taika Waititi. The positive is that you've got the option of listening to the track on either 4K or standard HD; however, the drawback is that Waititi's commentary is a very mixed bag. The director ends up trying too hard to crack jokes throughout, especially in the first 15-20 minutes. Luckily, after about half an hour, Waititi seems to realize that he's got to deliver more actual substance, because he starts working "anecdotes" into the conversation. And that's a good thing, because he's clearly a comic-book fan and isn't shy about pointing out the many references found throughout, from artwork inspired by -- and literally taken from -- Jack Kirby, what storytelling threads come from Thor comics and what comes from Planet Hulk, and why certain outfits and accessories are different than their comic counterparts. It's just … a struggle to get through the other parts that connect joke after joke, and yeah, he brings his young child into the conversation about the Thor-Hulk battle, which is both cute and lackluster. 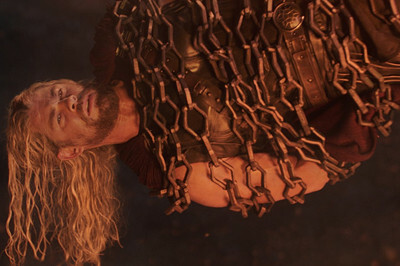 Chris Hemsworth mentioned in an interview that he had grown somewhat "bored" after playing Thor in the same way a handful of times, so he and the folks at Marvel used Ragnarok as a way of overhauling the character and going in a different direction. After The Dark World's more stoic, Shakespearean vision that wasn't as well-received as the others, a natural assumption would be that they'd go in a lighter, more effortlessly enjoyable direction, but one might not expect how relentlessly humorous and … well, polar opposite that Taika Waititi's film plays out. Despite the grim intentions of end-of-the-world prophecy and legitimately scorned family members out for power and murder, the story deliberately skews toward amusement and whimsy, telegraphing just as much -- if not more -- comedy as it does action. 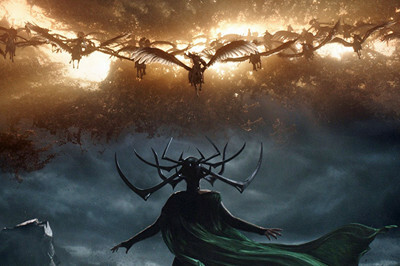 A handful of punchlines are duds and the film does try too hard to get laughs on the regular, but Thor: Ragnarok still ends up being a blast of a time and a worthwhile evolution of the Norse god for a more contemporary perspective on his character. 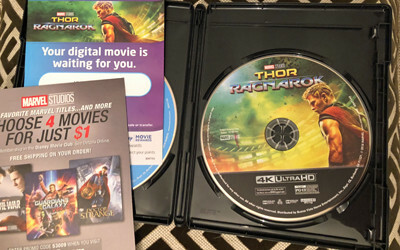 Marvel's 4K release looks great and sounds, well, good enough, and the extras include a peculiar commentary from Waititi, a half-hour of solid featurettes, and a cluster of other goodies. Highly Recommended.